I cannot believe it is so close to Halloween. I used to beg for time to move faster toward Halloween and Christmas because it seemed time moved at a glacial pace. I wanted so badly to dress up, then segue into the holidays… and now time is hurtling toward the end of the year like a runaway train. … But I’m not complaining 🙂 I love this time of year so much! 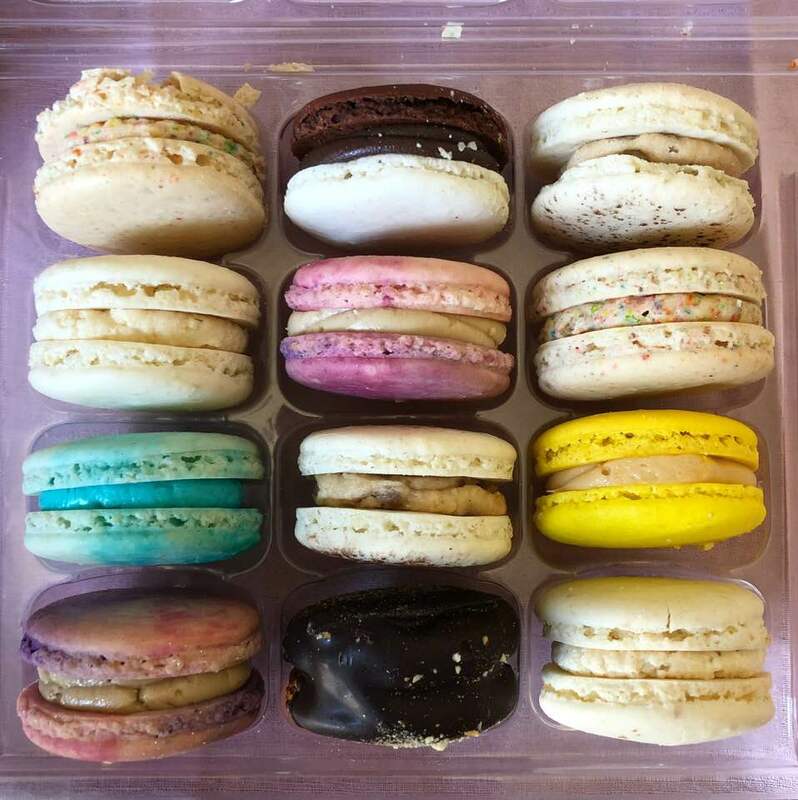 I got these macarons shipped to me from my fave bakery, Dana’s, in NYC! Okay, so technically this was late last month when their flavor of the month was Rice Krispy Treat, so you KNOW I had to get them! They did not disappoint! American Horror Story started late last month as well, and I have to say, I’m somewhat enjoying this season so far. Anyone else watch? I am *almost* done Christmas shopping! Yes, you read that correctly. I am an EARLY shopper, preferring to get it done and out of the way. I’m also a notorious over-spender, and I may have outdone myself this year. Oops! #NotSorry. When do you usually shop? Are you a last-minute person or an early-bird like me? I’m back to blonde! I liked the purple hair, but blonde is my comfort zone for sure. Now it’s time for some links I’m loving this month! As always, feel free to leave links to things you’re loving as well in the comments! Picked up the black version of one of my fave pairs of glasses (I own the now discontinued blonde shade). Love them! And then I went to Nordstrom and bought these to make into prescription everyday frames. Oops. I mean, rainbow/glitter/cat-eye/black? My dream glasses! I am obsessed with maroon/rose gold tones on my eyelids, so this palette is a godsend! So flattering for all skin tones. Once a week I like de-gunking my skin, and I found this brand in my latest FabFitFun box and LOVE it. It totally sloughs off all the crap and makes my skin so soft. Butternut squash all the things! I’m trying not to wear this sweater every day, but it is hard since it is so soft! As for books, I recently read this book and it was… bizarre and unusual. Unlike any other book I’ve read, actually. I think I enjoyed it? It’s graphic, absurd and surrealistic. I also read this, which was a fun spooky book that was elegantly and illustratively written. And right now, I’m enjoying this short-story collection by Curtis Settenfield. Each story is succinct but detailed, telling tales of the complicated lives of an assortment of women. Next up, I think I’m going to read this novel about a young orphan who becomes a Vegas showgirl in the 1950s. I’m not normally a period-piece person, but I can’t resist the opulence and glamour of 50’s Vegas, and it sounds like it has enough grit to be edgy. …Or this one, which sounds very suspenseful and gripping! It’s starting to get chilly here in Sacramento, so I purchased this to keep me warm during early-AM walks with my boys! I love that it has POCKETS. My ideal dress! Velvet + cute collar + astrology, obviously. And now, some monthly splurges! If I had an extra rent check to cash, I’d surely buy these! So over-the-top and ME! This is also a splurge, but I ended up getting it because A) I am a fan-user year-round; B) because I love the idea of an air-filter (hello, asthma! ); and C) because I LOVE the idea of no blades to clean! With two dogs, there’s ALWAYS dog hairs and gunk clogging my current fan’s blades. I’ll letcha know how I like this next month! As always, feel free to drop some of your fave links in the comments below! Disclaimer: this post contains Amazon affiliate links. If a purchase is made using one of my links, I receive a small commission at no additional cost to you. Thanks for keeping my blog alive! That is a cute dress, Hayley, but I have to admit, those galactic pajamas you were wearing last month are unforgettable. Great book recommendations. I was thinking of how you are quite a cruise aficionado, and I read a book called “The Last Cruise,” and it may be something of interest to you. I’m watching AHS too, and it’s hard to keep everything straight and see how every episode ties the entire series together because the story gets so complicated, but I like it better than last season. Hi Amanda! Thanks for the book rec! I’ll definitely look into that!